For spring break, six students and two faculty members decided to do something much different with their time off. From March 10–18, the group headed to the tropical, rainforest-covered Central American country of Costa Rica. With help of Director of Experiential Learning and International Education Jenny Weatherford and Associate Instructor of Spanish and English as a Second Language Rachel Chrane, students Arika Brown, Ally Dula, Contessa Gunter, Kimberly Paniagua, Tea Johnson, and Dean Wheeler headed out on a trip of a lifetime. 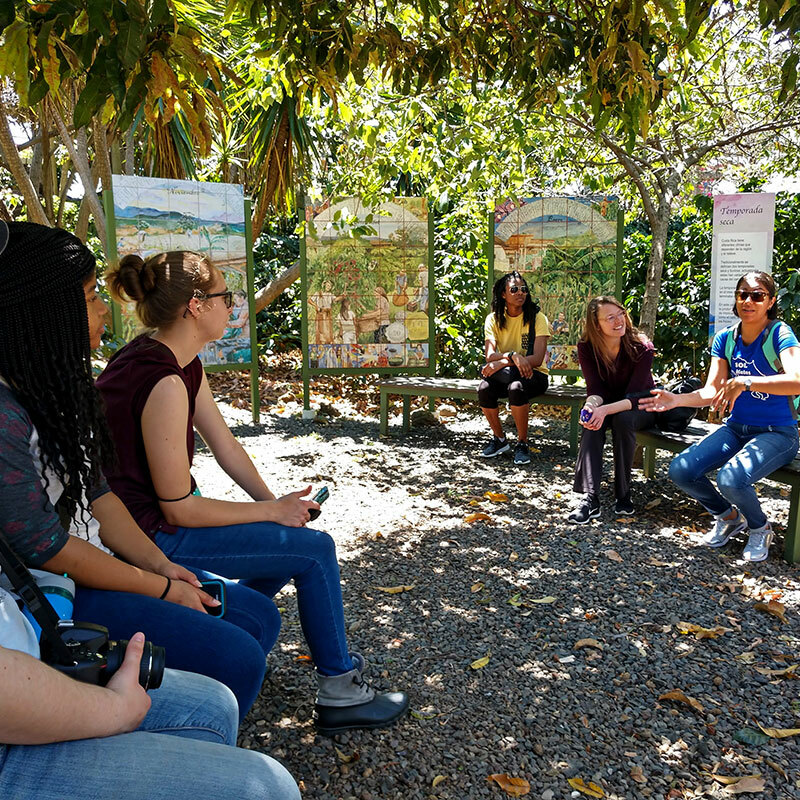 The students, varying in major and class year, went with the help of Sol Education Abroad—a study abroad and Spanish immersion program with study opportunities in Costa Rica, Argentina, Mexico, and Spain. Costa Rica can be found bordered by Nicaragua on the north, Panama on the south, and the Caribbean Sea and Pacific Ocean lining its rich beaches on the east and west coasts, respectively. Rugged and overflowing with tropical wildlife, over a quarter of the country’s area consists of protected jungle. The country is also home to some of the world’s tallest waterfalls and volcanoes that are still active to this day. Take the journey with students as they fly south and discover why exploring new places can mean much more than a new stamp in a passport. 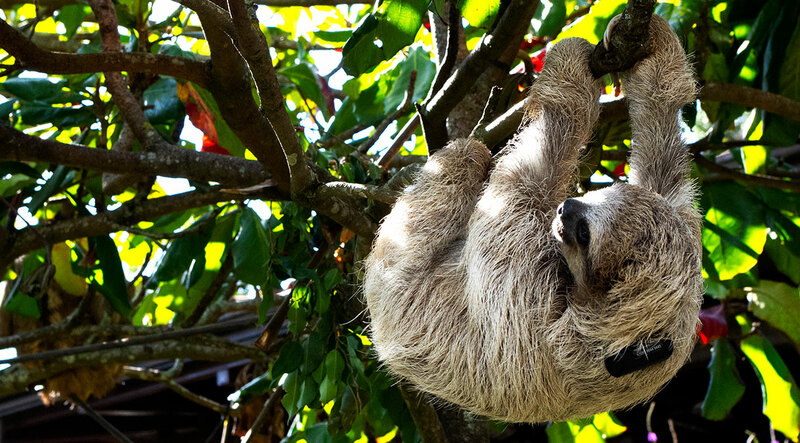 An adult sloth hangs from a branch at the Toucan Rescue Ranch. Free to climb where they wish, the wildlife wear GPS collars to ensure their protection. The collars also help researchers track the animals should they be released back into the wild. One of the first few excursions on the trip was, for many of the students, a major highlight. For a country filled to the brim in lush plants, it may only be beat by its diverse—and adorable—wildlife. First stop? Nearby Toucan Rescue Ranch (TRR) for a tour and a behind-the-scenes look at the organization’s work. Established in 2004 with the primary focus on toucans, the well-known rescue, rehabilitation, and release center has since expanded its care for countless creatures that call Costa Rica home. Similar to the May Wildlife Rehabilitation Center here on campus, the TRR focuses on a model that centralizes conservation, education, and research “in order to ensure a brighter tomorrow for native wildlife,” according to the TRR website. Since graduating, Dula has invested her time in traveling and learning about animals around the world—in fact, she’ll be traveling later this year to New Zealand with a group from the May Wildlife Rehabilitation Center. 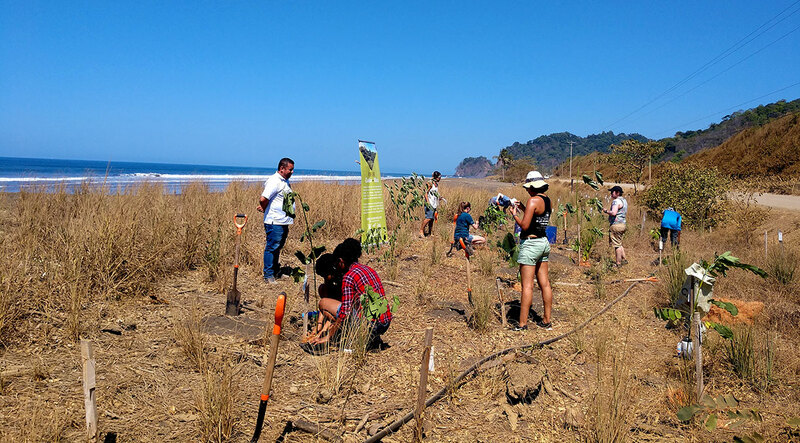 (Top) Students and leaders meet their director for the day before they begin planting trees along the Playa Hermosa coastline. (Bottom left) Ally Dula ties a sapling to a wooden stake with information both about the tree and the name of the person who planted it. (Bottom right) Dean Wheeler takes a moment to write his name on the sapling tag. 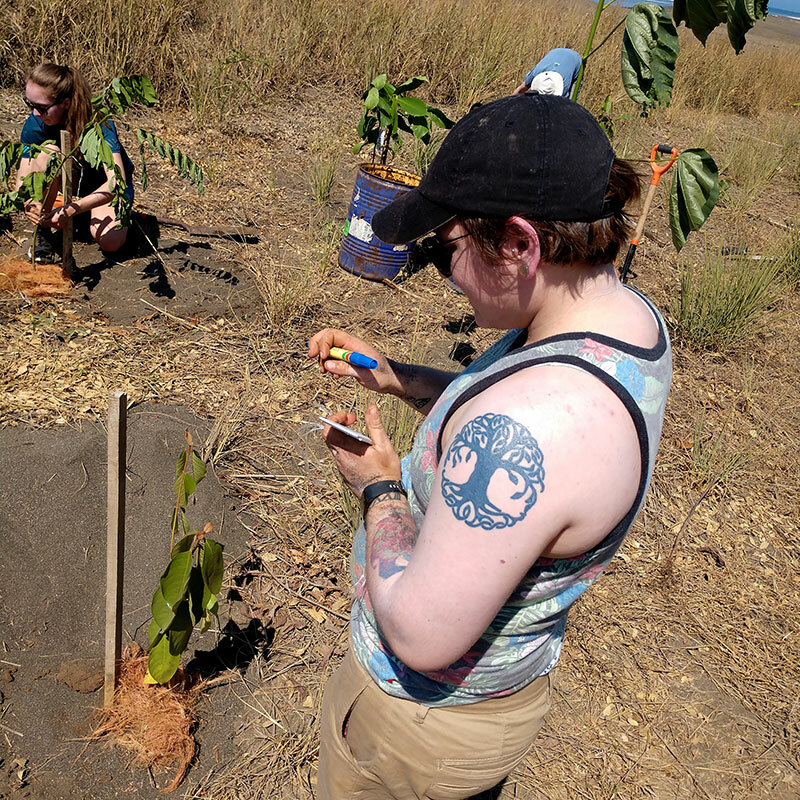 In order to avoid the beaming sun and thick humidity, the group often set out on their excursions early in the day, especially when heading out to the Costas Verdes Biological Corridor Reforestation Tree-Planting project in Jacó, Costa Rica, located on the Pacific Coast. There, the group met with Federico Gutierrez, the director for the Costas Verdes (translation: green beaches) project. 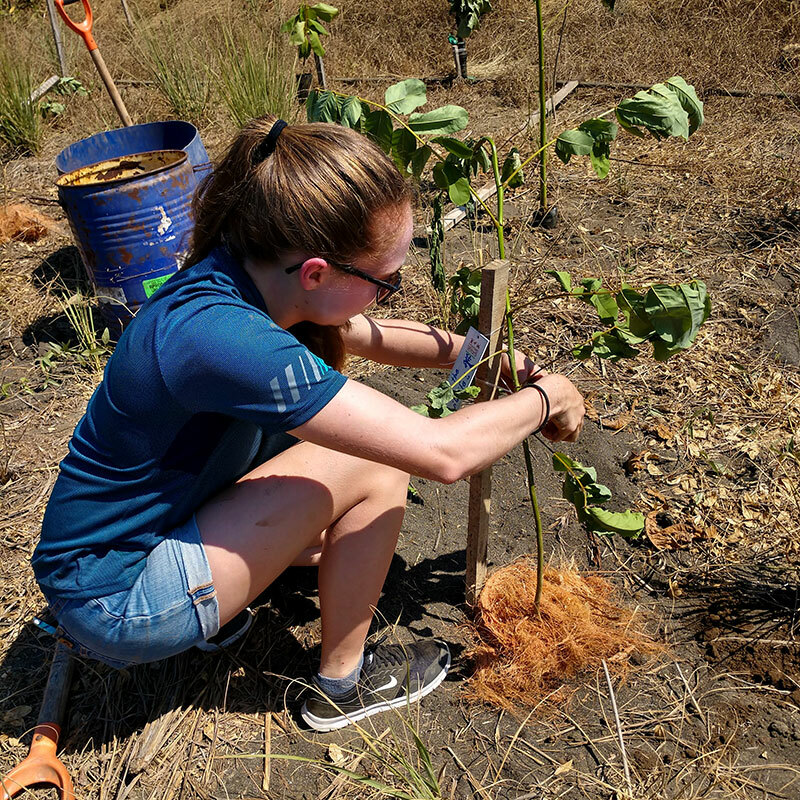 For the better part of the morning, everyone pitched in to help plant native trees and bushes that would one day fill out the beach’s once lush coast. Founded in 2008, Costas Verdes is a non-profit organization with a mission of “conserving and restoring coastal ecosystems on public lands, including protected areas, publicly-owned portions of beaches, mangroves, riverbanks, and wetlands,” according to the Costas Verdes website. Since its start, the program has enlisted the help of over 6,000 volunteers resulting in the planting of approximately 45,000 trees across seven beaches. Jenny Weatherford, director of experiential learning and international education, said she and Sol Education Abroad placed a large focus on learning from, and working with, local people and businesses. Later on in the trip, the group went from the beach to the rainforest to experience Costa Rica not only from down below, but also high above. 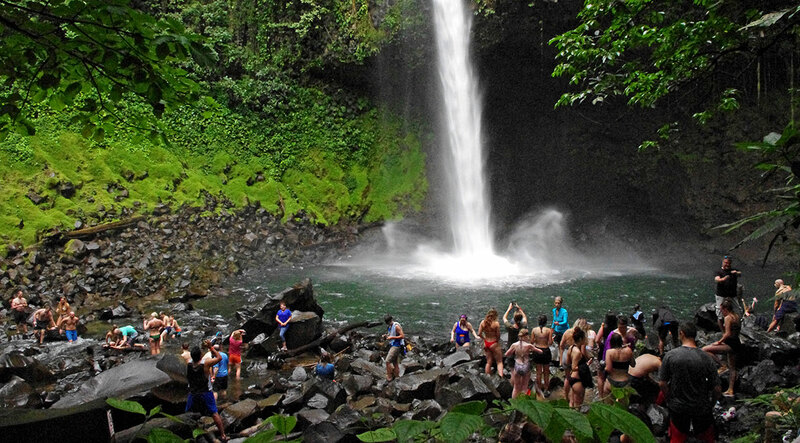 Cue the 246-foot waterfall, La Fortuna, found in Arenal Volcano National Park. Visitors from around the globe gather at the base of 246-foot-tall waterfall, La Fortuna, in Arenal Volcano National Park. Even though the water was cold, curious visitors still took the plunge. A short, but steep hike along a staircase carved into the hillside separates visitors from the entrance to the open pool where people can swim and enjoy the natural feature. The waterfall is just a few miles from the park’s namesake—Arenal Volcano. At 5,479 feet above sea level, the 7,000-year-old volcano most recently erupted in 2008. Since then, the volcano has remained dormant. Unfortunately, because of hovering cloud cover, the group was unable to see the peak of Arenal, but the evidence of volcanic activity was apparent even in the foothills of the park. Nearing the end of the week, everyone had the chance to take a tour of the jungle by air—zip lining to be exact. Arika Brown glides above treetops on the final days of the memorable Costa Rica trip. One of the first stops during the trip was to the Museo de Cultura Popular (translation: Museum of Cultural History) in Barva, Costa Rica, approximately five miles north of the country’s capital of San José. There, the group toured the museum as well as the surrounding property that featured two large replica caricature-style masks of early settlers. On the inside, exhibits highlighted Costa Rica’s customs, lifestyles, and way of living. 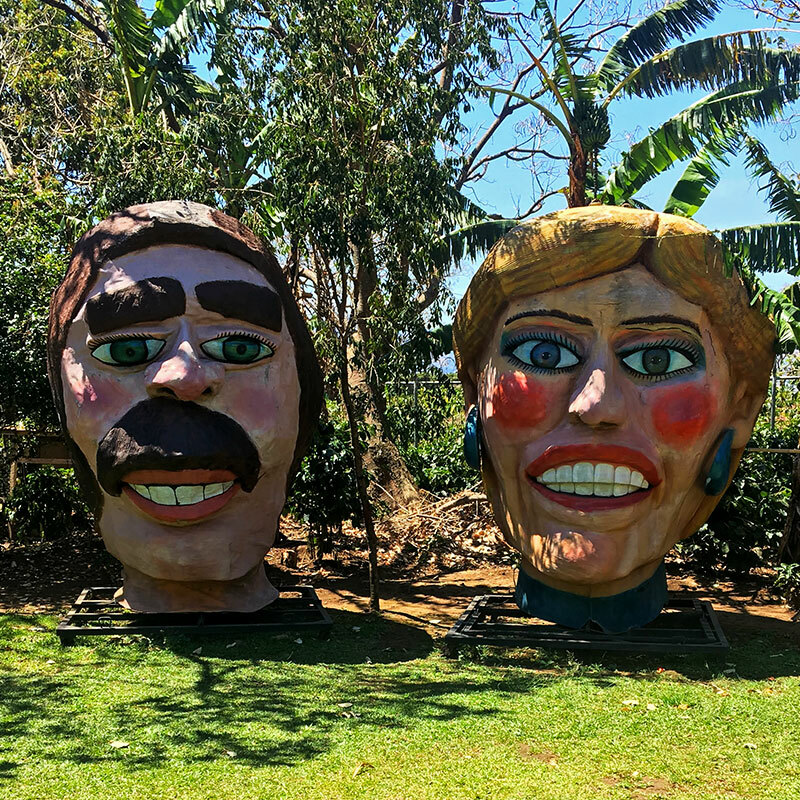 (Left) Two large masks depicting early settlers to Costa Rica greet visitors to the Museo de Cultura Popular. (Right) Students and trip leaders meet their Sol Education Abroad director and guide for the week under the welcomed shade of native trees. Later in the week, the group also had the chance to take an authentic Latin dance class instructed by local, professional dance teacher Alejandra Fonseca. Paired off, the students learned steps to essential Latin dances including salsa, merengue, cumbia, and bachata. With encouragement, and a little bit of practice, the group caught their groove. The students even took a Costa Rican cooking class. Dressed in red caps and aprons, the instructor taught students how to make everything from tortillas, to gallo pinto (rice and black beans), and drinks like fresco de cas (sour guava juice) and delicious Costa Rican coffee. Even the small changes in how people prepare their food was a shift for Kimberly Paniagua who has spent her fair share of time in nearby countries such as Mexico. In Costa Rica, tortillas are made and cooked in a large stone oven or griddle over an open fire, and coffee is made pour-over style through mesh cheesecloth before dripping directly into a mug. For Costa Ricans, food is part of the culture as much as anything else is. 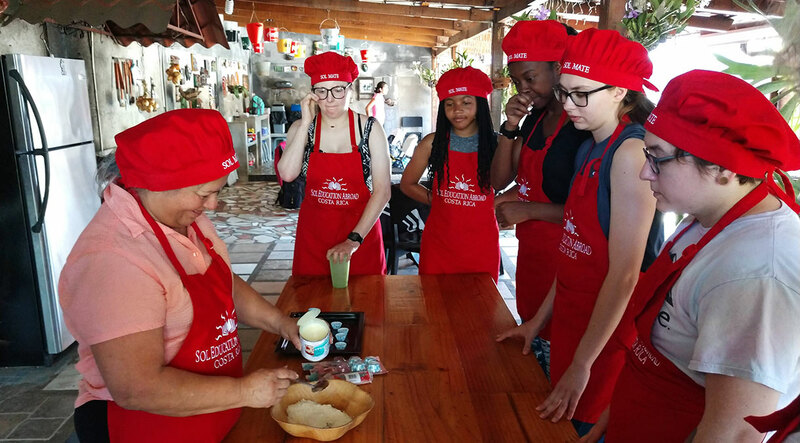 Students look on as their cooking class instructor leads them through traditional Costa Rican recipes including a sweet treat consisting mostly of shredded coconut and condensed milk. The culture shock was a whirlwind for most, if not all the visitors, including seniors Tea Johnson and Arika Brown—especially when it came to the housing arrangements. Following a busy first day, students and trip leaders headed to their host families for the night in Heredia, Costa Rica, where the group had their home base. In pairs, they were assigned to a different family all located a few blocks from one another—friends Johnson and Brown were housed together. They both admitted they weren’t the most fluent in Spanish, and said the language barrier posed an interesting challenge, but as the days would go on, both they and the host family would learn how to communicate—either by using a translation app on their phones, or just reading each other’s non-verbal cues. Brown said the experience was so eye-opening and welcoming that if she ever had the chance to study abroad in Costa Rica again, she would want to go back and live with the same family. 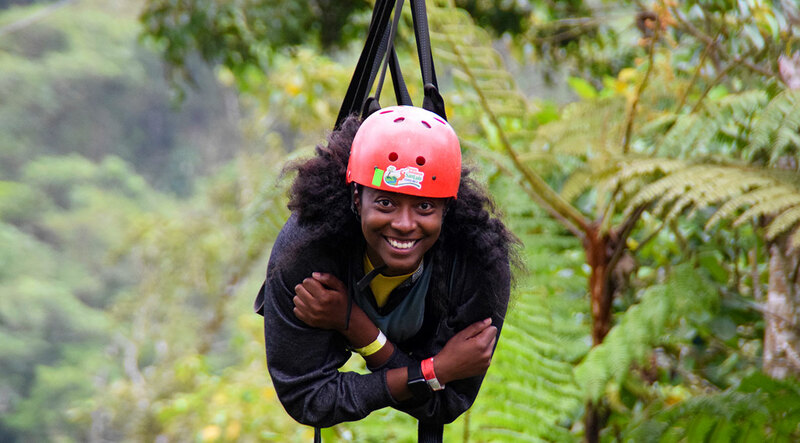 “I learned so much about Costa Rica and how people live by just seeing how they interact day-by-day, prepare their meals, and spend time,” Brown, a senior biology major, said. Rachel Chrane, associate instructor of Spanish and English as a second language, and someone who has traveled to Costa Rica a few times, summarizes how important it is to learn about a new culture through immersion. For everyone, the week was more than just a trip—it was an experience that broadened their horizons and allowed them to not only learn about a vivid country, but also about themselves. Weatherford said weeklong trips like the one students embarked on are a great introduction to world traveling. For Chrane, trips like Costa Rica allow her and her students to create bonds with the local people and businesses—connections students can walk away with for the rest of their lives.